Among all the Yangtze River cruise ships, there are some top new cruise ships that were built or refurbished just during the past 3 to 4 years. Choose one ship from the recommended new cruises with advanced technologies and cruise facilities, updated services and management level, various entertainments to meet the demands of modern travellers, and other high quality experience to start your lifetime memorable Yangtze River cruise holiday! Platinum Series Century Cruises: Century Paragon and Century Legend were designed by the Yran&Storbraaton from Norway and built under the technical guidance of EMS and Schiffstechnik Buchloh from Germany, and adopted the value of “Eco-friendly, energy-saving, low-carbon, and humanized” from the Northern Europe, which has lead the high-tech technology revolution of the construction of Yangtze River cruise ships, more importantly, provided the much better experience of body and mind of all guests on the cruises. Many “FIRSTs” creators: first using the world top technology of electricity propulsion and rudder propeller systems and creating many “Firsts” and other “Uniqueness” from the skills, cruise facilities, designs, decorations, recreation equipment, and so on, Century Paragon and Century Legend are among the top choices of new things lovers. Suites of Ideal comfort: Century Cruises puts emphasis on the design of cruise suites, so the suites onboard Century Paragon and Century Legend are more spacious and better for the living habits of people. The so large bathroom with a bathtub, cozy beds with soft and warm bedding articles, an opening private balcony, international standard room amenities, advances appliances, and so forth are prepared by the responsible cruise company to give guests the real ideal comfortable stay in the river cruise. 2. President No.7 & President No.8, only from $386 - $436. New large Yangtze Cruise ship: both built in April in 2013, with the length of 146.8 meters and the width of 20.2 meters, President No.7 and President No.8 are both the top new and largest cruises on the Yangtze River. Modern fine room for better rest: standard cabins and suites are designed and decorated according the habits of people and themed with the traditional western cultural characteristics of modern technological languages and classic European aesthetic feeling tones. With the modern new facilities, air-conditioners, private bathrooms with bathtubs and shower, private balconies for sightseeing, people onboard President No.7 and President No.8 can surely have a comfortable rest. High standard cruise facilities: facilities and equipment in both your rooms and public areas are all updated very much. Besides, excellent restaurants, luxury and large indoor swimming pool, Karaoke rooms, internet area, gym, massage center, sauna, high standard cinema, children’s paradise, etc. are arranged with strict management and available for everyone. 3. 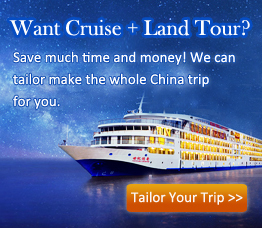 Yangtze Gold 7 & Yangtze Gold 8, only from $417 - $489. Spacious rooms with advanced facilities: the total 190 cabins and suites are relatively spacious. To offer better experience for travellers, the Yangtze Gold Cruises equipped the rooms with new and advanced facilities that are expected and reputed well by a lot of cruise travellers, such as a private balcony, television, cozy beds, a private bathroom, broadcasting system, air-conditioner, and so on. Great new technologies: Yangtze Gold 7 and Yangtze Gold 8 has adopted the advanced technologies and systems to reduce and damping and noise onboard the cruise, which can make the noise down to only around 45 decibels in the public areas and 40 decibels in the rooms. Apart from that, the central ventilation system also will make the air fresh and flow efficiently, so that passengers onboard the cruise can get much better experience and a nicer mood, and get closer to the natural Three Gorges. Rich activities for recreation: in order to meet the satisfactions of modern traveller guests as much as possible, the Yangtze Gold Cruises has arranged a series of interesting activities, like chess & card playing, KTV enjoying, movie watching, sauna and massage relaxing, shopping, swimming, foot massage experiencing, kite flying, etc. lectures about Chinese medicines, paintings and calligraphy, the Yangtze River, and so on. Besides, you can appreciate the night performances and enjoy other fun entertainment to spend your days. Time is wonderful onboard Yangtze Gold 7 and Yangtze Gold 8. Check more detail information about Yangtze Gold 7 and Yangtze Gold 8! Apart from the recommended top new cruise ships constructed in recent years, here is a recommended newly refurbished cruise, Victoria Katarina, which is also a good choice for your new experience of the Yangtze River cruise trip! Check the details at below! Victoria Katarina, only from $382 - $469. Newest Yangtze River cruise ship: Victoria Katarina was refurbished just in 2014, which makes it the newest cruise ship on the Yangtze River and enables Yangtze River cruise travellers to experience the new facilities, decorations and other new things to try onboard this updated ship. American managed cruise ship: as ship of the only Yangtze River cruise company under the American management, guests onboard Victoria Katarina can enjoy the high quality service from the warm-hearted staff and be take good care by the multi-language-speaking (including English) cruise manager through the sailing. Fresh experience of great fun: hours onboard Victoria Katarina will be wonderful and meaningful. Besides the leisure or happy time in the bar, dancing ball, karaoke rooms, chess & card room, etc., diversified cultural activities and lectures about Chinese Tai Chi, paintings, calligraphy, costumes, and so forth are arranged from the morning till the night. Just get relaxed in the fun. Note: For more detail info of each new Yangtze River cruise ship, please feel free to contact our professional Travel Consultant!